Every club has them, Club Heroes who will forever be remembered. For some, it takes years of dedication and commitment to one club to achieve hero status. For others, it can come in less than a heartbeat. The latter can be said on the man we’re looking at today. Our destination is Humberside and one of the greatest days in the orange of Hull City. The Premier League. The best league in the world. The home of some of the best players. The home of the best stadia. It’s every club’s dream to reach the Promised Land. It is the equivalent to heaven. The Championship play-offs every year provides four sides the chance to dream and earn promotion to the best league in the world. Let’s turn the clock back nine years and it was Hull City’s chance to desire a place in the top-flight. The Tigers had never tasted the top-tier of English football. In fact, the Humberside club were more used to Glanford Park than Goodison Park, more used to Spotland than Stamford Bridge. But all that changed on one summer’s afternoon under the Wembley Arch. In the 38th minute, Frazier Campbell burst into the 18-yard area. Edge of the six-yard box, wide left, he looked up. There stood Dean Windass, a man who looked more Sunday League than Premier League, on the edge of the 18-yard area. The ball was cut back to the 39-year-old. He struck through his laces. The net rippled. The biggest goal in the history of Hull City – the goal which sent them into the Premier League. Windass celebrates opening the scoring for Hull City against Bristol City in 2008. It was a goal that sent Windass into the history books. The target man, in his second spell with The Tigers, would be playing Premier League football yet again. At the KCOM Stadium, he is a Club Hero. Born in 1969, Windass is a Hull lad by heart. He grew up in a generation where supporting your local side was the norm. As a child then, he would make the journey from the Gipsyville area of the city to Boothferry Park. Here he would watch what, can only be described, as average football. There was no Manchester United or Liverpool playing on the turf of Boothferry Park; instead Hereford, Crewe and Halifax were more likely opponents for The Tigers. It didn’t hinder Windass’ enthusiasm for the game. By the late 1980’s, he was a youth team scholar with Hull. The chance of professional football for most is an unrealistic dream; but to play for your local side, is indescribable. But football clubs are ruthless places. Brian Horton was a ruthless character. If he was a local character or not, it didn’t matter. Windass was dismissed. Perhaps the dream of playing in the orange of Hull City would only remain a dream. Perhaps the aim of playing professional football would fail also. After his departure from the Humberside club, he had trials with the likes of Cambridge City, York and even Sunderland – all of them ending unsuccessful. But a change in management changed everything. Horton departed and in came Terry Dolan. He liked the look of the young forward, he got him off the building site and into Boothferry Park. At 22 though, he needed to make an immediate impact. Primarily starting in midfield, he did just that. And he became a fans’ favourite. His six goals in the 1991-92 season earned The Tigers a 14th place finish in the Third Division. His seven goals the following campaign secured their safety in the third-tier of English football. But, it was at this point where he began to reach his peak. They always say that a side needs a 20-goal-a-season man. In 1993-94, that man was Windass for Hull. His 23 goals secured Hull a ninth place finish, just five points adrift of the play-offs. He netted an extra 17 goals the following term. But, as the 1995-96 season just got underway, a new destination was on the horizon for Windass, it was Scotland. Aberdeen came calling. Hull were forced to accept their bid due to the financial difficulties on Humberside. A bitter-sweet way to say goodbye to his hometown club. He made the move north of the border. It was going to be difficult for all of Windass’ family. Not just Dean, as he married two years previously, and had a young son, Josh, who now plays for Rangers. But football would make him feel at home. He soon became a fans’ favourite under Roy Atkien. But there was one problem, his disciplinary record. It would be the primary reason why he left Pittoride. After three years at the club, Windass departed. His next destination took him back to his hometown country. Oxford United was the next club to lure Windass. But following the club’s relegation to the old Second Division, he made the move back to Yorkshire, Bradford City lied in wait. Under the guidance of Paul Jewell, Windass tasted Premier League football for the first time. Late drama at Valley Parade on the final day of the 1999-2000 season, condemned Wimbledon to the drop, and not the Bantams. They would eventually fall back into the Football League the following season, with Windass making three appearances in the year the Yorkshire side were relegated. But the Premier League came calling again. This time it was Middlesbrough who wanted Windass. But he never really fitted in on Teesside. After short spells with both clubs of the Steel City and a return to Bradford, came a chance he could not turn down. 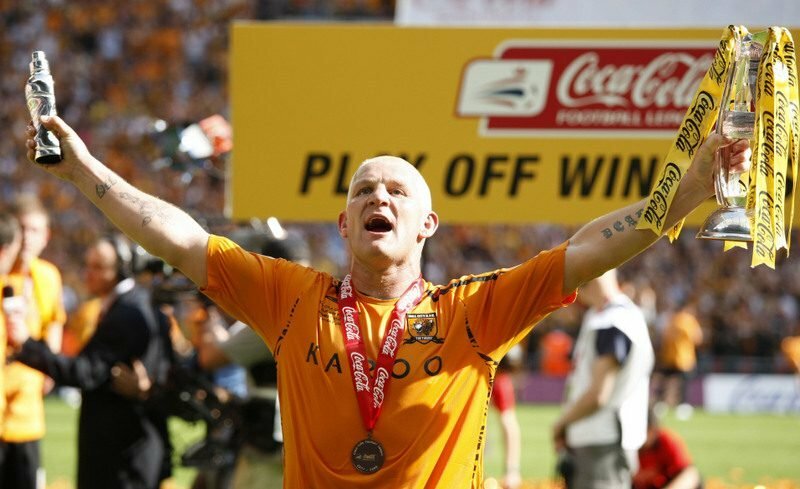 Hull City, then a mid-table Championship club, wanted Windass to come home. A return to Humberside was attractive, and after an initial loan spell, he made the move permanent in 2007. The following season, can only be described as the best of his life. Under the guidance of Phil Brown, despite defeat on the opening day to Plymouth, Hull creeped into the play-off positions. The Premier League was only three games away. The first test, to defeat Watford, a side who had just been relegated a year earlier. They defeated them with ease, winning 6-1 on aggregate against a Hornets side who finished sixth. Wembley Stadium, May 24, 2008. The day where dreams came true. His first half-strike edge of the 18-yard area earning Hull a place in the best league in the world. Windass would only make another five Premier League appearances. Despite him netting on one occasion, he would be used to the pitch of Boundary Park more that season than the Premier League. He departed Hull in 2009, ending his career with Darlington, before his retirement in 2010. But, no matter what happens, Windass will forever be remembered as the man who guided Hull City to the Premier League. Not bad, for a kid from Gipsyville!